Wasson: Industry analysts are now seeing that more than 50 percent of workers are using personal mobile devices in some capacity to access business networks. Increasingly, they're asking to access not just email and calendar, but also enterprise apps and resources. IT did a great job of supporting mobile workers with laptops and early mobile devices for quite some time, but much of that was with IT-controlled systems. What we're seeing now that’s a little bit different is increasingly those mobile workers like the ease of use and the speed at which they can get to their email and their calendar apps with their own mobile devices. They now want IT to extend that so that they can get the same access to enterprise apps and resources on mobile devices that they've enjoyed on their IT controlled laptops over the years. Gardner: It seems that there are unintended consequences here. What’s happening now that we have this pull in the BYOD direction? I was sitting with someone at one of the big financial firms in New York City the other day. We asked them about their BYOD strategy and he took a humorous approach to it. He said, "Yes, we have a really well-defined BYOD strategy ... As long as the device is the one we assign to you and uses the software that we approved and control all the policy on, you can bring it." I think that that’s not too uncommon. What mobile device management needs to do for them is what laptop device management has done for them in the past. The key things to think about there are looking at when you're actually deploying those devices. Maybe you have end users that are purchasing personal units, and maybe you don't know initially. Maybe you don't have the same level of knowledge about that unit or ways to track it. Wasson: What’s different here is that now you have a mobile device that is the conduit coming into the network. Whereas in the past, folks had been using primarily laptop VPN clients, that paradigm changes a little for the mobile world. Mobile users like the convenience and the ease of being able to use mobile applications. These are clearly two different risk categories. If they want to get access to the same data, then you're probably going to do slightly different things to have things happen. You are going to have lots of different layers of security but they all need to be very well connected to one another. They need to be able to share data, share that context, and in that sharing, be able to create the right circumstance to have a secure access to whatever data is going to make the efficiency for that person be maximized. 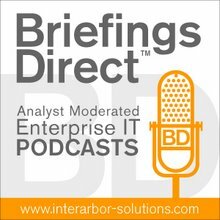 Gardner: When you do go mobile first, with your network containment activities, with your connected security around access control, and when you've elevated management to mobile device management, you're probably an organization with better policies and with better means or security in total. Gardner: Do we have any examples or anecdotes of organizations that have taken this plunge, embraced BYOD, perhaps with some mobile first mentality thrown in, and what are the results? What did they get? Wasson: Educational institutions are probably some of the earlier adopters for using mobile platforms to access their back-end systems, and yet educational institutions also are very often required by law not to make inappropriate sites and things available to students. Gardner: Any thoughts Jane on where the security equation might shift in the future? Gardner: Let’s get a little bit more on the BYOD vision from Dell Software. Let’s hear what you have in mind in terms of how one should go about, as an IT organization, getting a better handle on this.